Retronyms Wej bluetooth MIDI interface and LED light show is now available on Amazon. Material: Soft Touch, 30 durometer, silicone body in Tabletop Grey. 48 full-color RGB LEDs, individually addressable from Arduino. 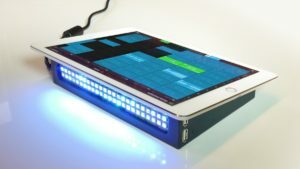 Animations triggerable from Tabletop-ready iOS app via MIDI or inter-app audio. 2 powered USB host ports — Two way MIDI. Bluetooth LE configured with a service that provides Apple’s MIDI over Bluetooth protocol.